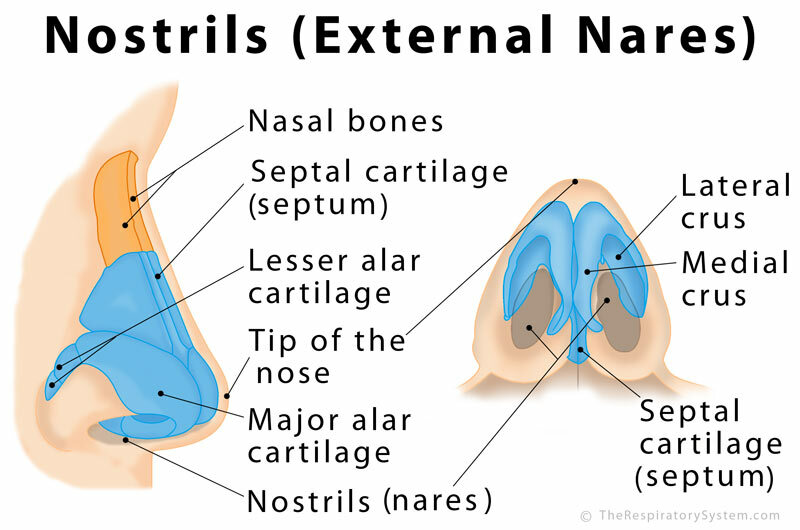 Nostril is the common name for the two anterior nares  (singular: naris) – the external openings in human nose that leads to the nasal cavity . They are the connection between air in the environment and the airways, through the posterior or internal nares, the inner opening of the nasal cavity into the pharynx . The septal cartilage or septum forms the wall between the two external nares , with the separation visible from the outside. 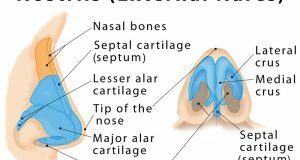 The greater alar cartilage forms the lateral and medial boundaries of the nostrils, also being responsible, along with the lesser alar cartilage, for their overall shape [3, 4]. Usually, the two nostrils are of the same shape and size. However, in some individuals the septum may be a little uneven, causing the nostrils to be of different sizes. Such unevenness, in a severe form, is known as deviated septum . The primary purpose of the external nares is to let air enter the nasal cavities so it can be purified and sent to the next parts of the respiratory tract. It also allows different scents to enter the nose and reach the olfactory region of the nose . The way humans have two eyes to help perceive the depth of images, and two ears to determine the location and distance of the origin of sounds, the two nasal cavities also have a crucial purpose to serve – helping the nose to remain clean. Due to the purification of the inhaled air within the nasal cavities, all the impurities remain stuck in the nasal mucus, making it more swollen on one side. So, it has less space for air passage. As it gets rid of the dust and impurities, the second nasal cavity then takes over the task of purifying the air and carrying it down the airways. By the time the former is all cleared up, the mucus layer of the other nasal cavity swells up and needs time to clean up. So the first side again starts to actively cleanse the air, and the nasal cycle continues. This is more evident when you have a cold, and your left and right nose takes turns to remain clogged, especially when you lie down . 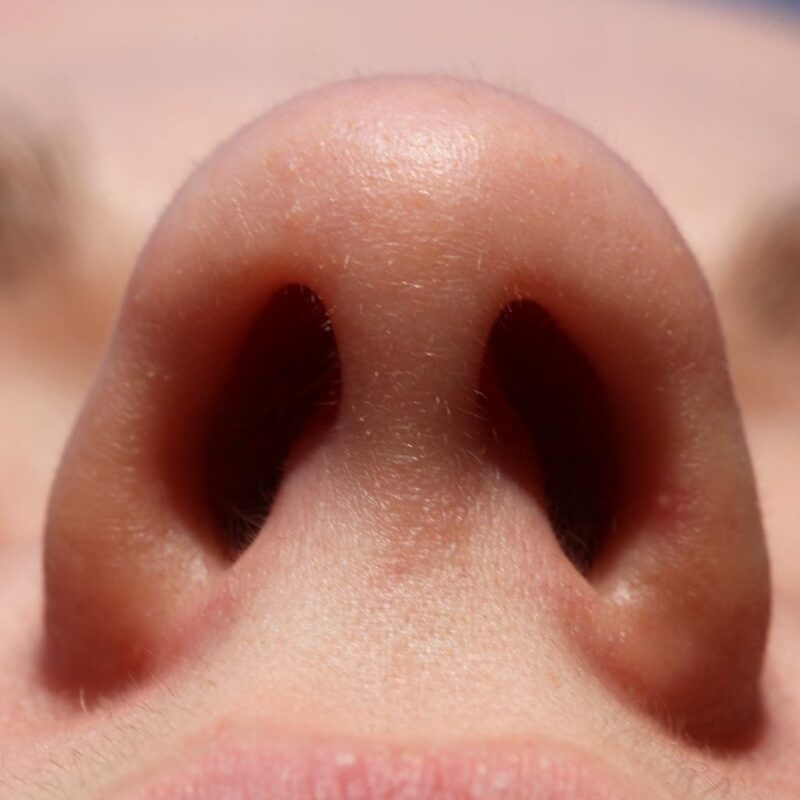 Having two nostrils is believed to enhance the sense of smell in the same manner, as one of the cavities always works better than the other in picking up smell .